The day before Kim Jong Il's funeral last month, George Hadjipateras, 36, put on a black suit and tie and drove to the North Korean embassy in west London. Beneath a portrait of the Dear Leader, the office clerk laid a floral tribute, red carnations arranged in the shape of a star. He shook the hand of the first secretary lengthily as he pressed upon him that Kim was "a shining light, not just for his people, but for revolutionaries worldwide." "I mentioned to him I had lost my own father in September, and so this was doubly tragic for me," Hadjipateras says. "My voice broke a bit then." He had been closely monitoring Kim's health since his 2008 stroke and was blindsided by the death. "It's tragic; he should have been getting better," he told TIME. "I was as upset as the English were when the Queen Mother died." Kim's passing did not exactly move Hadjipateras' fellow Britons to similar displays of grief. Viewed outside his homeland as a crackpot dictator, his death was taken mostly as an opportunity to snicker at his excesses. 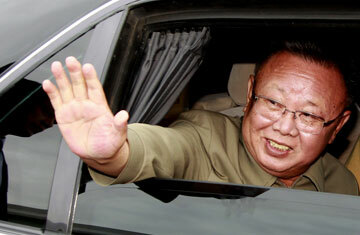 But despite a scarcity of flowers at the embassy, Kim did not go unmourned in the West. For a decade, Hadjipateras has belonged to the Korean Friendship Association (KFA), an international fan club for the isolated, nuclear-armed neo-Stalinist regime. Its founder is Alejandro Cao de Benós, 37, a Spaniard sometimes known by his adopted Korean name Zo Sun Il, meaning Korea Is One. Cao de Benós was an idealistic, revolutionary-minded teenager when he first struck up a relationship with North Korean delegates at an international tourism fair in Madrid. On subsequent trips to Pyongyang, he cultivated sufficiently influential connections that by 2000, he was able to convince the regime to allow him to set up the country's first Web page, the only fixed, widely accessible line of communication between the Hermit Kingdom and the wider world. Site traffic from foreigners curious to know more about the mysterious country prompted him to set up the KFA the same year, and he claims it now has 15,000 members in 120 countries. North Korea, Cao de Benós says, was surprised to learn it had friends abroad, and part of his work had been to encourage the regime to show a more open face to its sympathizers. "The country has been under attack, which has made the DPRK [Democratic Peoples' Republic of Korea, the North's official name] so wary," he says. "I tell them, If you close the doors completely, nothing bad will enter, but nothing good will enter, either. We can't shut out our friends." Those friends are typically drawn to North Korea by a sense of ideological solidarity with one of the last keepers of the Communist flame, but even more so by a powerful curiosity about the enigmatic society. Through the KFA, members can study juche, the state ideology of self-reliance, or buy obscure recordings of military parades or songs. Those seeking more active engagement can travel to North Korea on solidarity tours, or participate in pickets of the U.S. embassy. Frank Martin, a Parisian banker and KFA member, wrote to French newspaper editors in the days after Kim's death, chastising them for their mocking tone. "I read some [headlines] like: 'A Buffoon Who Composed Operas While His People Were Starving,'" he told TIME in an e-mail. Read "North Korea's Runaway Sushi Chef Remembers Kim Jong Un."